Find this book at Amazon.com | buch7.de | eurobuch.com | buchhandel.de | books.google.com ASIN=089526899X, Category: Economy, Language: E, cover: PB, pages: 106, year: 1989(1958). "[If anybody says,] that he is opposed to capitalism, there is a wonderful way to answer him: "You know that the population of this planet is now ten times greater than it was in the ages preceding capitalism; you know that all men today enjoy a higher standard of living than your ancestors did before the age of capitalism. But how do you know that you are the one out of ten who would have lived in the absence of capitalism? The mere fact that you are living today is proof that capitalism has succeeded, whether or not you consider your own life very valuable."" "The attacks against capitalism - especially with respect to the higher wage rates - start from the false assumption that wages are ultimately paid by people who are different from those who are employed in the factories." "There are people in many countries who consider it very unjust that a man who has to support a family with several children will receive the same salary as a man who has only himself to take care of. But the question is not whether the employer should bear greater responsibility for the size of a worker's family. "The question we must ask in this case is: Are you, as an individual, prepared to pay more for something, let us say, a loaf of bread, if you are told that the man who produced this loaf of bread has six children? The honest man will certainly answer in the negative and say, In principle I would, but in fact if it costs less I would rather buy the bread produced by a man without any children." "The capitalist system was termed capitalism not by a friend of the system, but by an individual who considered it to be the worst of all historical systems, the greatest evil that had ever befallen mankind. That man was Karl Marx." "An often unrealized fact about capitalism is this: savings mean benefits for all those who are anxious to produce or to earn wages. When a man has accrued a certain amount of money - let us say, one thousand dollars - and, instead of spending it, entrusts these dollars to a savings bank or an insurance company, the money goes into the hands of an entrepreneur, a businessman, enabling him to go out and embark on a project which could not have been embarked on yesterday, because the required capital was unavailable." "The scornful depiction of capitalism by some people as a system designed to make the rich become richer and the poor become poorer is wrong from beginning to end." "Marx said the belief that labor unions [by asking for higher wage rates and shorter work hours] could improve conditions for the working population was absolutely in error. ... [Marx] suggested that the unions set themselves a new, revolutionary goal: that they do away with the wage system altogether, that they substitute "socialism" - government ownership of the means of production - for the system of private ownership. "We must refute the doctrines that promote union violence. We must oppose the confiscation of property, the control of prices, inflation, and all those evils from which we suffer." "[T]he so-called German economic miracle - the recovery of Germany after its defeat and destruction in the Second World War. But this was no miracle. It was the application of the principles of the free market economy, of the methods of capitalism, even though they were not applied completely in all respects." "[T]he notion that a capitalist form of government can prevent people from hurting themselves by controlling their consumption is false. The idea of government as a paternal authority, as a guardian for everybody, is the idea of those who favor socialism." "More important than the body is the mind and the soul, and man hurts himself much more by reading bad books, by listening to bad music and looking at bad movies. Therefore it is the duty of the government to prevent people from committing these faults." "And, as you know, for many hundreds of years governments and authorities believed that this really was their duty." [A]ll this enthusiasm in favor of socialism by the rising generation of [artists], is based on an illusion. I mention this because these groups are among the most fanatical supporters of the socialist idea." "[I]f the enterprise does not become profitable ... the enterprise must come to an end. "[Romans] enforced price control [after having debased coinage], but they failed to maintain the society. The result was the disintegration of the Roman Empire and the system of the division of labor [disappeared]. "The long lines of people waiting at shops always appear as a familiar phenomenon in a city in which the government has decreed maximum prices for commodities that the government considers as important. This has happened everywhere when the price of milk was controlled. "Before the government interfered, milk was expensive, ... Therefore, the total consumption of milk drops. "[I]t will finally arrive at a point where all prices, all wage rates, all interest rates, in short everything in the whole economic system, is determined by the government. And this, clearly, is socialism. "The idea that there is a third system - between socialism and capitalism, as its supporters say - a system as far away from socialism as it is from capitalism but that retains the advantages and avoids the disadvantages of each - is pure nonsense." "[I]f the quantity of money is increased, the purchasing power of the monetary unit decreases, and the quantity of goods that can be obtained for one unit of this money decreases also. "There can be no secret way to the solution of the financial problems of a government; if it needs money, it has to obtain the money by taxing its citizens .... But many governments, we can even say most governments, think there is another method for getting the needed money; simply to print it. [ed. note: Mises did not talk about the important consequences of inflation on the profitability of business, i.e. : that at a certain inflation rate, companies can longer be profitable after tax. This is brilliantly explained in The Warren Buffett Way by Robert G. Hagstrom. "Today the techniques for inflation are complicated by the fact that there is checkbook money. With the stroke of a pen, the government creates fiat money, thus increasing the quantity of money and credit. ... [T]he certain fact about inflation is that, sooner or later, [it ends] with the [catastrophically] breakdown of the currency. ..."
How long does inflation run? "[In contrast to the gold standard] under an inflationary system, nothing is simpler for the politicians to do than to order the government printing office to provide as much money as they need for their projects. ... [U]nder inflationary conditions, people acquire the habit of looking upon the government as an institution with limitless means at its disposal: the state, the government, can do anything." How to attain a raising standard of living for everywhere? "Not protection, not government interference, not socialism, and certainly not the violence of the labor unions (euphemistically called collective bargaining, which, in fact, is bargaining at the point of a gun). To attain the end, as I see it, there is only one way! ... [T]here are no short cuts to an earthly paradise. It takes time, and one has to work ... under good policies." 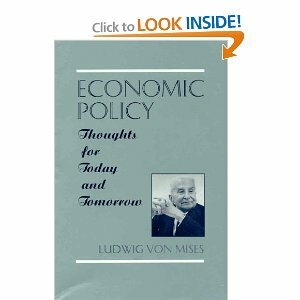 For more lectures see von Mises' The Free Market and Its Enemies : Pseudo-Science, Socialism, and Inflation"
*) Times change. In 2003 Ben Bernanke advised Japan in order to get out of deflation, to create inflation (using price targets to correct the past effects of deflation), where he used the term "inflation a tax:"
"... from a public finance perspective, increased monetization of government debt simply amounts to replacing other forms of taxes with an inflation tax." which he already outlined in his "Japanese Monetary Policy: A Case of Self-Induced Paralysis," 1999. See also "What If?" (in "Should the Fed be Responsibly Irresponsible?") Paul McCulley (PIMCO), 20-Jul-2009. Seems that after minimum wages the world will get a minimum inflation rate, because ... we need it!